clean things up or go for a walk? Aennon offers the best solution for your hands-free lighting! • Camping, running, caving, fishing, biking and other outdoor sports. • Construction, household work and professional use. • Automotive roadside safety, auto repair. • Power-outage convenience and home security. • STEADY Red LED (No annoying flashing red light like other headlamps). • Red LED light ideal for reading, preserving night vision, and not disturbing others. • Easy-to-use single button control. • Easily adjustable elastic headband to fit any head size. • Fits around head, hat, helmet, bike or belt. • Long LED lifetime up to 30,000 hours. • Sturdy headlamp body tilts up to 60-degrees, allowing you to focus light as needed. • The beam remains fixed in your preferred position. • Shock-resistant, ultra-strong glass lens. • Up to 30 hours of battery life. You are protected by a no risk, no questions asked, money back guarantee! ✓ INSTANTLY IMPROVE YOUR VISIBILITY WITH HANDSFREE, BRIGHT LIGHTING – Why struggle to hold a flashlight when you need both hands to perform the task at hand? How much easier would tasks, walks or jogs at night be with two free hands? ✓ CLOSE-UP DETAILED WORK AND LONG-DISTANCE VIEWING IS NOW A BREEZE – The sturdy head torch body tilts up to 60-degrees, allowing you to focus light where you need it. Plus, the 4 light modes ensure you get the exact level of brightness you need for any use through single button control. ✓ WATERPROOF & COMFORTABLE – Why equip yourself with anything but the best and most comfortable head torch? 220 Lumen of darkness-busting power for up to 150 meter of visibility. IPX4 Waterproof grade ensures protection against splashing or spraying water from any angle. Weighing only 70 gram you won’t even notice wearing it. 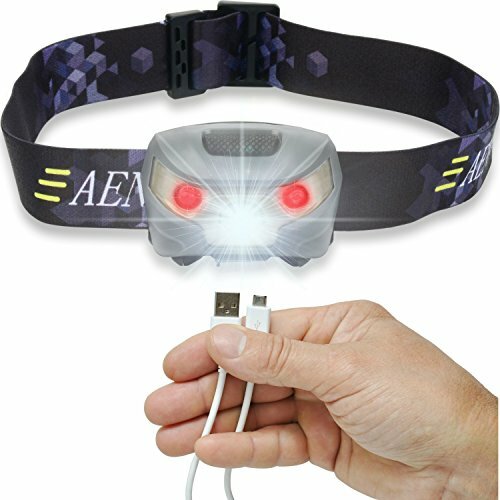 ✓ NEVER BUY BATTERIES AGAIN – USB rechargeable head torches will fully charge from any USB port in just 4-6 hours and will provide up to 30 hours of constant light on a single charge (USB cable included). Perfect gift for family & friends, order 2 and give one to your friend!